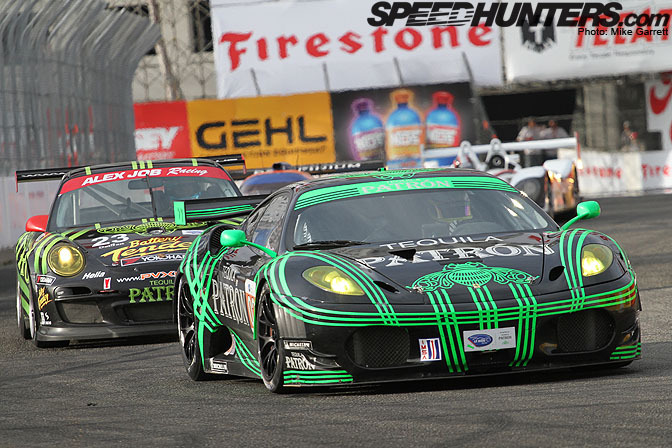 Now to continue Grand Prix of Long Beach coverage with some race action from the American LeMans series. 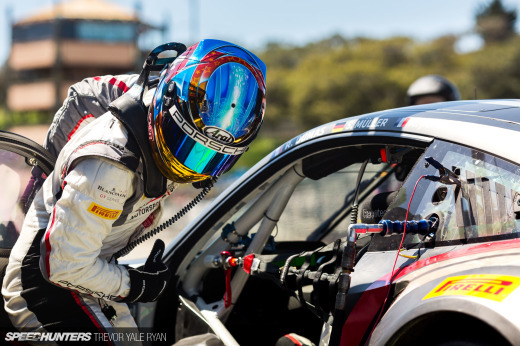 The last time I'd shot ALMS was at Laguna Seca last year, so I'd had an itch for some sports car action for a while. 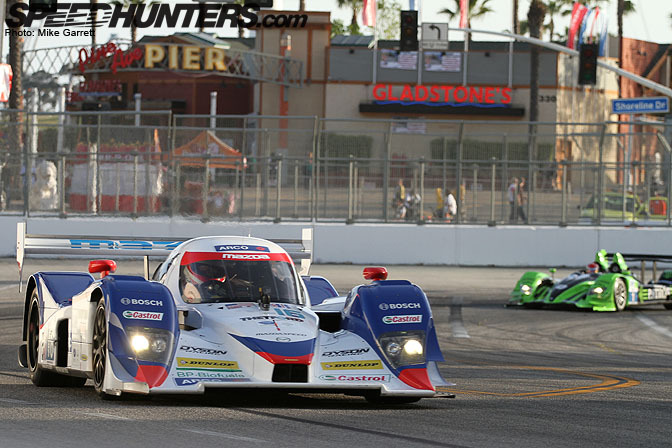 What better place to take in some American Le Mans than on the streets of Long Beach? 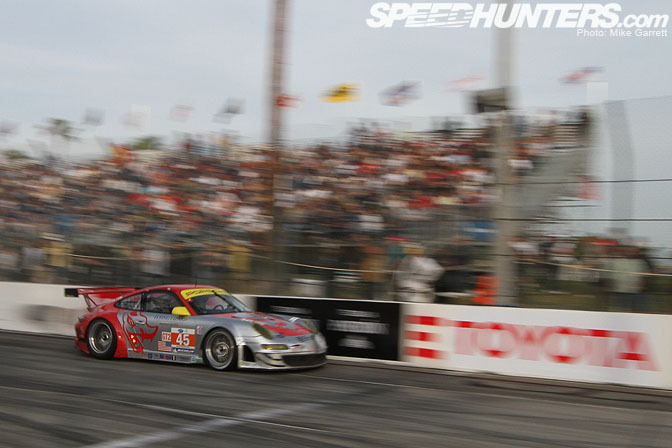 Here the #90 M3 takes turn one during the opening moments of qualifying. 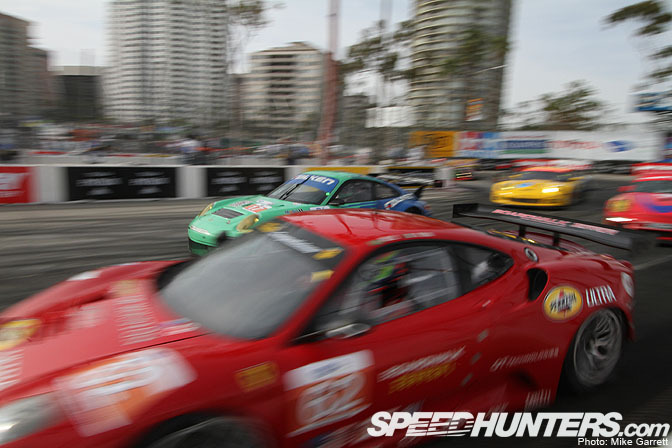 This corner is a pivotal part of the track, as cars slow from the long full-throttle run down Shoreline Drive. 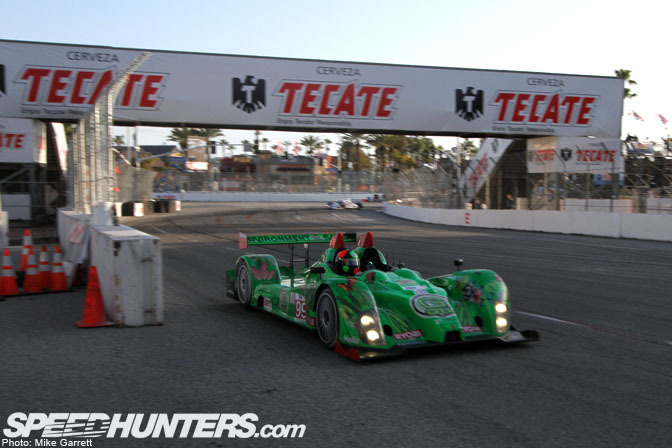 Also during qualifying, one of the Dyson Mazda LMP's pulls out of turn six and onto what is usually known as Pine Ave.
A scene from the early moments of the race, where the Falken Porsche has just passed the Risi F430 to take the lead in the GT2 class. 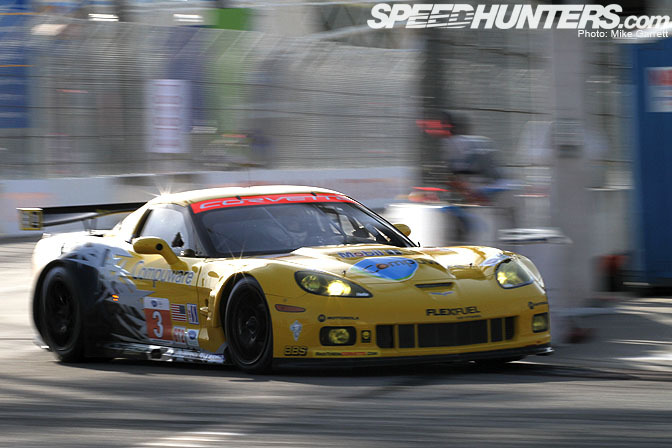 The sound of the GT2 'Vettes is unlike anything else on the track. There were more than a few times when I wish I'd picked up a set of the $1.00 earplugs they were selling all over the damn place! 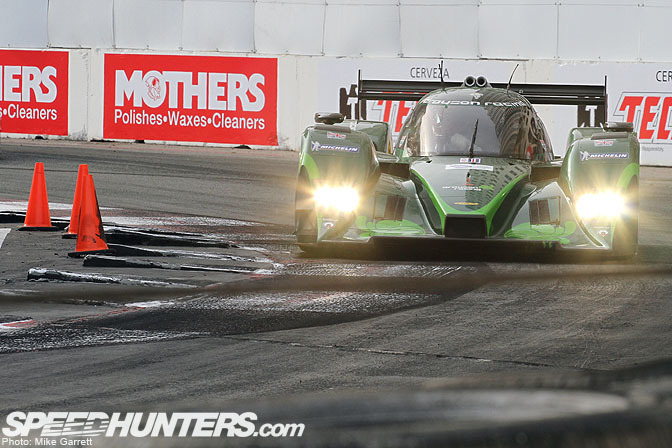 The E85-fueled Drayson Racing machine rounds turn nine, which still has a fresh layer of rubber from the previous weekend's Formula Drift event. 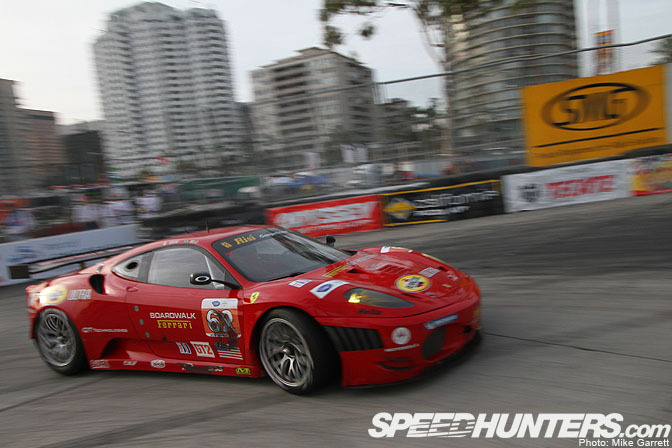 The Risi Ferrari rounds the turn 11 hairpin. 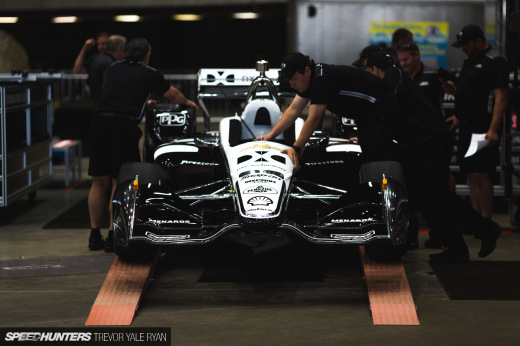 I could have literally reached out and touched the cars here – that's how close they get. 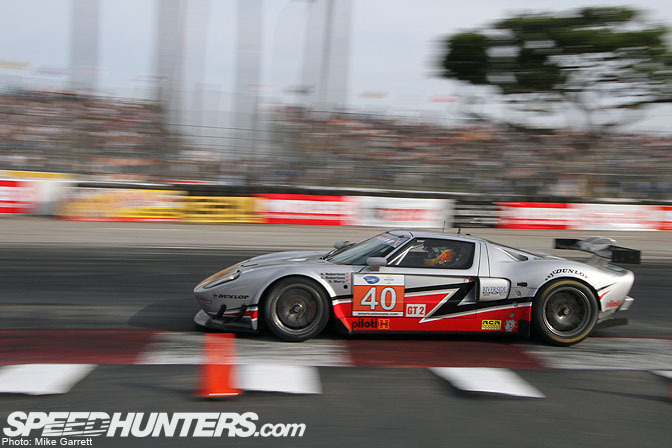 How can you not like the Robertson Racing Ford GT? Whether in race or street form, the Ford GT is still one of the most beautiful sports cars around. 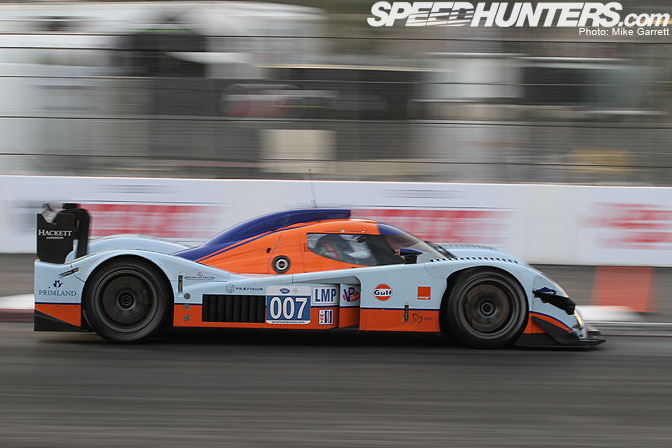 One of the spec FLM09's of the new LMP Challenge Class. Here one of the Patron F430's leads a pack of cars through turn 10 during a yellow-flag lap, about halfway through the race. 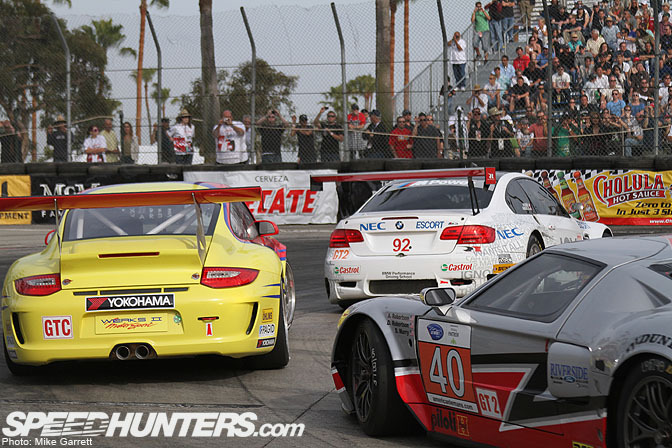 With all the different types of cars sharing the same tight street course, things could get pretty chaotic at times. 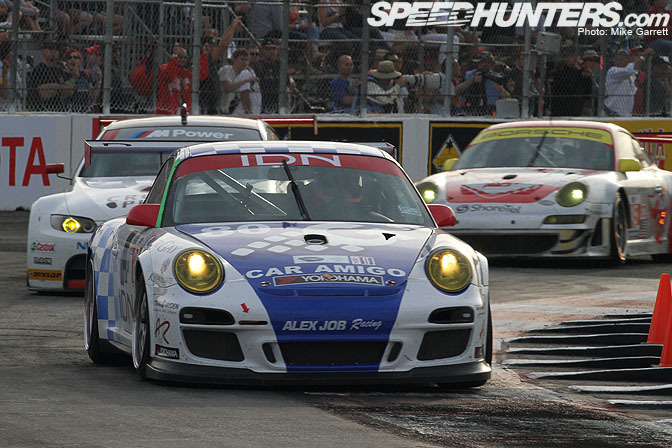 The GT Challenge cars were the slowest on the track, with the drivers keeping a close watch in their rear-views for faster traffic. 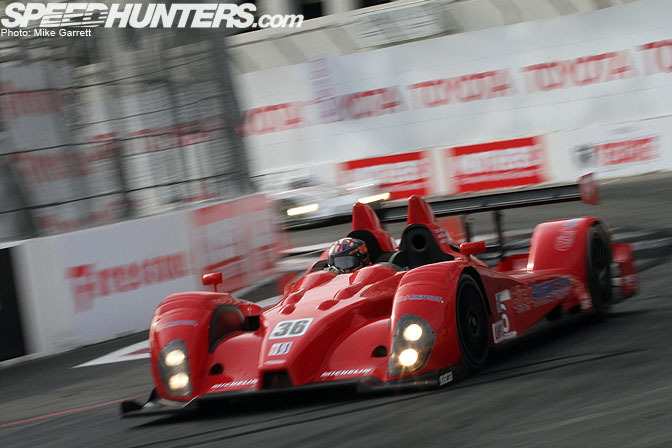 ..and finally the traditional LMP cars. 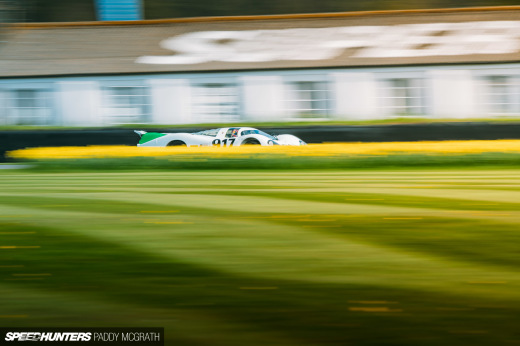 Nowhere was the traffic worse than in the turn 11 hairpin. Hey, this is SoCal after all. The hairpin is followed by another one of those ear plug moments, as the drivers hammer the throttle for the run down Shoreline Drive. 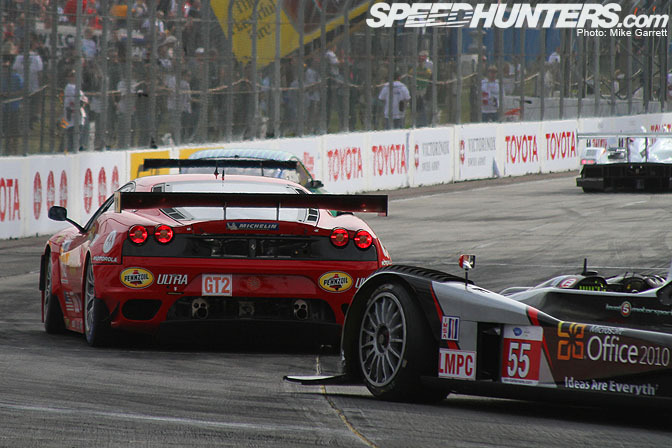 GT cars mixing it up around turn 10 late in the race. Another shot of the GT2 Jag. Oh what a classy machine you are. 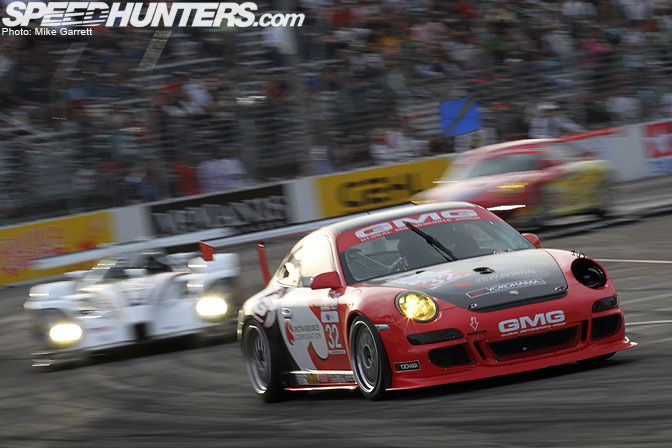 In closing, a view of the #45 Flying Lizard Porsche rolling past packed stands, on its way to victory in the GT2 Class. 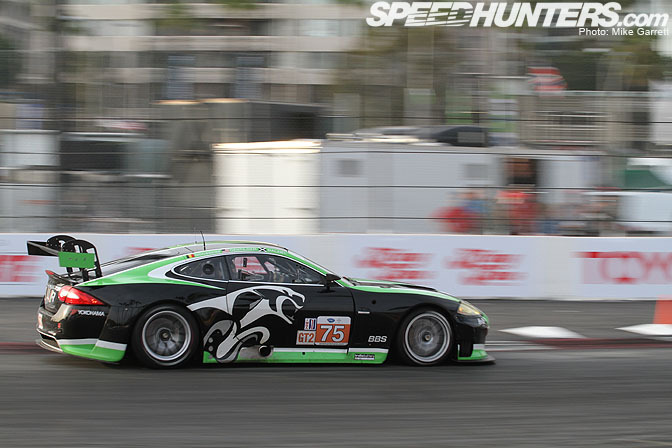 I'll be back soon with more from the GP of Long Beach, including a look at some of the off-track action. Nice Mike, nice, you nearly need body armour for the Vettes, never mind ear plugs! Amazing shots. That was such a good race. There is no hint of winners, losers, who's leading, who's behind, crashes, drivers' profile, results, highlights, just your mere opinion Mr. Garrett. How can you call this a coverage? Great pics Mike ! nice meeting you face to face finally. Keep up the great work sir. What's up with the strange wing mounts on the Jag? Never seen anything quite like that before. Thanks man! I'm sure all see you again soon. some really 'fantastic' photo's man - keep it up.. liking the GT2 Jag and i've soft spot for the beemers (those who know me, know why).. M3 (looking cool.. - great post!! Are we ever gonna get any of these in desktop size? 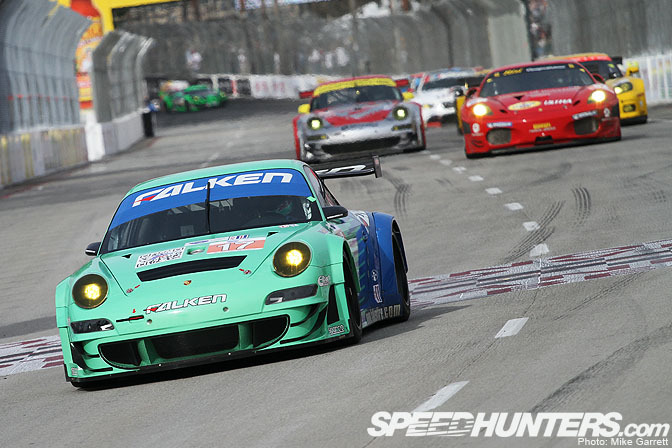 Particularly the one of the GT2 field chasing the Falken Porsche? the wing mounts on the Jaguar are based on the premise that airflow under the wing is more important than airflow over the wing. If you have to choose between disturbing airflow on the top vs disturbing airflow on the bottom, you let the top suffer every time. The prototype Acuras also have had a similar setup.